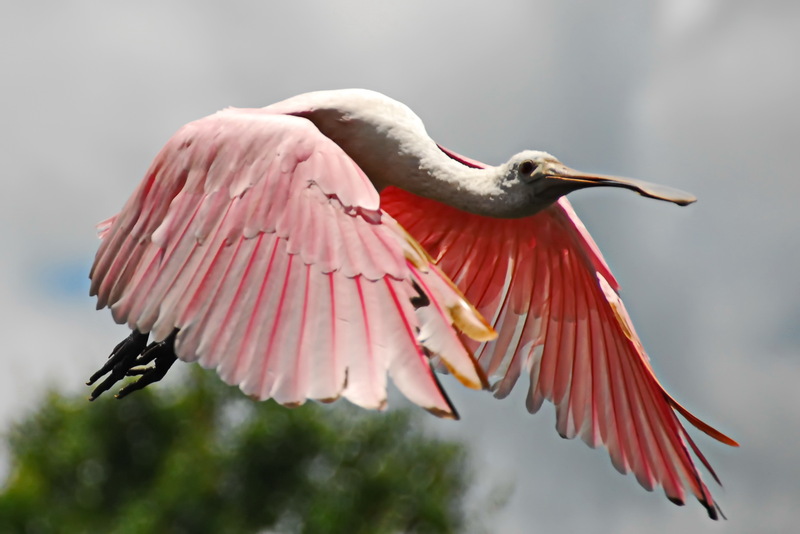 One recent evening just before sunset, I watched a flock of roseate spoonbills fly over Green Cay. What a magnificent sight! 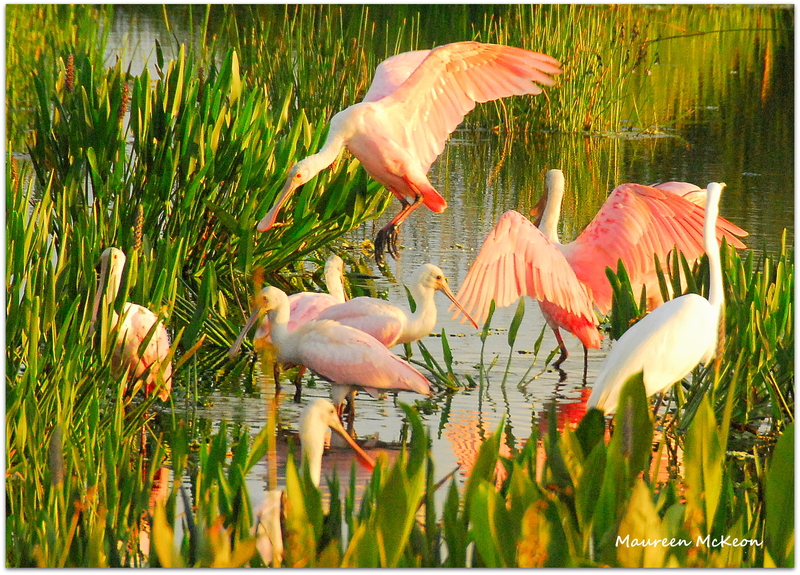 The twilight sky was brightened by a glorious flurry of pink and white feathers – from the softest blush of the young “rosies” to the vivid, bubblegum pink of the adult birds. As they gathered at a spot deep in the wetlands, I noticed something strange – an odd man (or rather, an odd bird) out. Right in the middle of this rosy crowd stood a stark white egret. At first, I was confused – what was he doing there? Then I found myself becoming somewhat vexed at the wayward bird. The nerve of him, ruining my perfectly pink group shot! 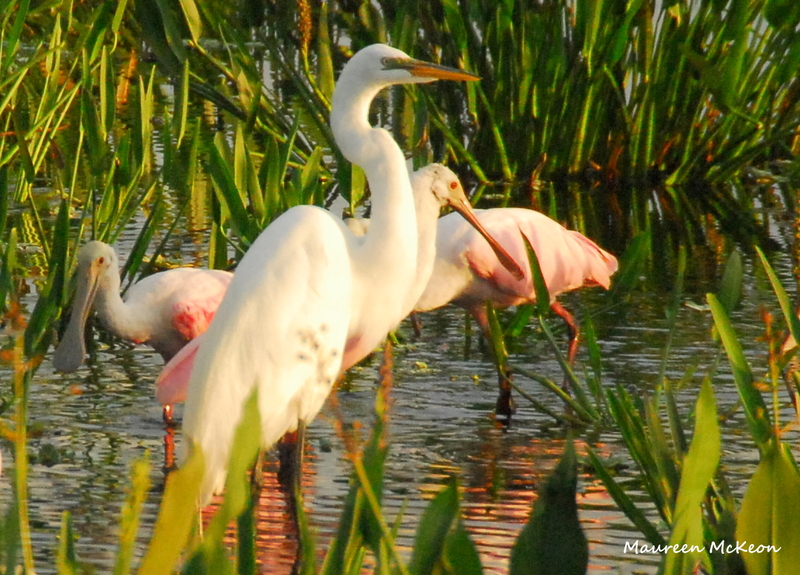 As I looked through my camera’s viewfinder, I silently willed the egret to move out of the way so I could get a clear shot of just the spoonbills. But there he stood, clearly unfazed by my assessment that he didn’t fit in. And the rosies didn’t seem to mind the interloper, either. When I finally relaxed and became fully present, I was able to appreciate the beautiful scene unfolding in front of me. How ridiculous – and arrogant – to want to change it! It was already perfect. Guess it stems from a stale, but stubborn old belief: to be accepted, you must fit in. Maybe some of you have struggled, as I have, with feelings of being slightly “less than”. A shrink might trace it back to my childhood, growing up as the only girl in a family of 9 kids. I spent a good chunk of my life feeling invisible. Painfully shy, but craving attention at the same time. 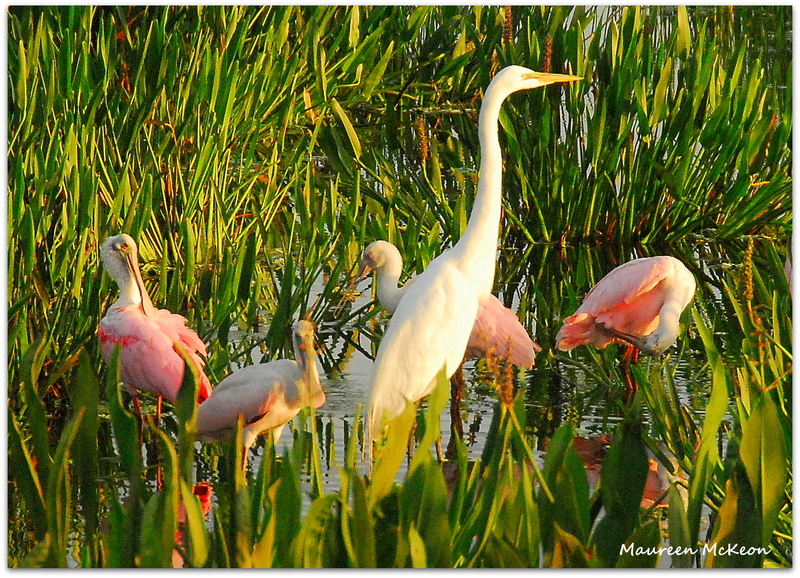 Besides, the white egret adds an interesting element to the flock of pink spoonbills, don’t you think? Thanks, Bryan. Exactly what I was trying to say! Great post Maureen. Yes, I sure have found myself feeling or thinking that I was out of place,…only to find out later that my intuition had me arrive a little earlier than my ego thought was appropriate. Thumbs up for intuition leading the way ! Thanks for your comment, Earl – and your honesty!